You are here: Home » MoneyTalk » Additional Topics » Why You Should Rotate Your Tires? 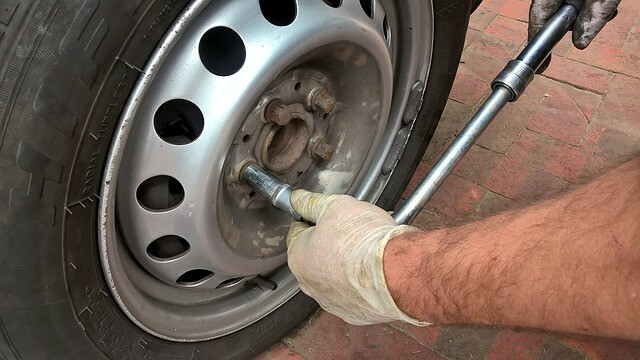 Rotating your tires just simply calls for the moving the position of the tire from the front of the vehicle to the back of the vehicle, or from one side of the vehicle to the other side of the vehicle. This is to ensure that all of the tires are receiving the same amount of wear. Evenly distributing the wear across all of your vehicle’s tires, helps to promote the longevity of your tires as well. It is recommended that you get your tires rotated every 5,000 to 8,000 miles, particularly the lower portion of the two. Most mechanics will recommend that you get your tires rotated when you get your routine oil changed, since your vehicle is already off of the ground, and that way you won’t wait until it is too late. What are the Different Ways to Rotate Tires? Tire rotation is based on the number of tires the vehicle has and it is based on whether the vehicle has rear-wheel or front-wheel drive or not. Front to rear– The tires are rotated from the front of the vehicle to the rear of the vehicle. This method is used for vehicles with the same size directional tires. Side to side– The tires are rotated from one side of the vehicle to the other side of the vehicle. This pattern is used for vehicles with different sized wheels that are non-directional. Rearward cross– The tires are rotated in a cross pattern: bringing the rear tires straightforward to the front positions, switching the sides of the 2 front tires, and then moving those front tires back to the rear position. This pattern is typically used for rear-wheel and four-wheel drive vehicles. Forward cross– The tires are rotated in a cross pattern similar to the rearward cross pattern. Here, the front tires will be moved to the back of the vehicle in the rear positions. The tires originally in the rear, will then need to be switched to opposite sides, and then moved to the front position. This pattern is used for front-wheel drive vehicles. X-cross pattern– The tires are rotated in a double cross/diagonal pattern, where the rear tires swap sides and the front tires swap sides, and then move the front tires to the rear, and the rear tires to the front. Essentially, you would just move the right rear tire to the front left tire position, the left rear tire to the front right tire position, the right front tire to the rear left tire position, and the front left tire to the rear right tire position, creating the X-pattern shape. This pattern can also be used on rear-wheel or four-wheel drive vehicles. If you own a truck or SUV that has an attached spare tire, you may choose to include that tire in your routine tire rotation. It is not necessary for you to do, but it does ensure that your tires are all getting the same amount of wear on them. How this tire would be incorporated depends on whether it is directional, or non-directional. If you have a rear-wheel or four-wheel drive vehicle you will use the rearward cross pattern to incorporate your 5th Move the rear tires to the front position, the front left tire replaces the spare, the front right tire moves to the left rear position, and the spare replaces the rear tire in the right rear position. If you have a front-wheel drive vehicle, you will need to use the forward cross pattern to incorporate your 5th Move the rear tires to the front position of the vehicle, but switch them to the opposite sides. Then, move the front left tire straight back, move the front right tire to the spare position, and move the spare to the right rear tire position. Tires are an important part of your vehicle. They are the only part of any vehicle that comes into direct contact with the road. Since tires are the only part of a vehicle that comes into contact with the road, a lot of your safety, and of others around you, is attributed to your tires. Therefore, it is really important that you have quality tires on your vehicle, and you replace them as necessary. If you do not rotate your tires, you will hear squealing noises and cause vibrations while driving on the road. These vibrations can eventually cause steering and suspension issues, if not addressed. Tire rotation is really important, and should be done regularly. However, a regular tire rotation will not fix the issue of alignment, uneven wear to the tires, or even tire pressure problems with inflation.